I heard about jamon for the first time so many years ago. Actually I was watching a food show on Spain where they showed these particular black pigs and this memory stuck with me since. Spending a year in this country I would eat this sweet cured meat at least once a week but I never researched further and I didn’t know too much about how they created this delicacy so when I came back to Spain I knew like all unique products, there is a unique story so I had to find out more! We began by meeting with Maria from Cinco Jotas at one of their black pig properties. Watch the video we put together below! The detail, care, attention and generations of experience have helped to create and shape Cinco Jotas and their jamon. We were served platefuls of this perfectly sliced jamon by their master carver and it tasted rich, balanced and of course a as a result many years of production as each jamon leg is hand crafted over time. Good things do take time! After visiting the black pig farm we drove over to the Cinco Jotas curing cellar, museum and tasting room (You can too and I’ve included the details below!). I wanted to really mention the background story of this product because the history and energy of the cellar was undeniably moving and reflective of passion, care and love behind this delicious product. For over 130 years, Cinco Jotas has maintained a natural artisanal production process for all its ham, preserving expertise and traditions acquired over the span of generations. The founders built a community in Jabugo to produce this unique and special product. Everyone was involved! Parents needed their children to be looked after so a school was built, transport evolved and even special transit stops were set in place to distribute the jamon. The entire town was working sustainably to build Cinco Jotas and helped create the product it is today. Something very important to mention is the breed of this pig. Authentic 100% Iberian ham can only be obtained from pure Iberian-breed pigs. The purity of an Iberian pig is determined by its genetic origins. To preserve the breed, only pigs whose mothers and fathers are 100% Iberian have this designation, and they are verified and registered with the official AECERIBER (Spain’s Iberian Swine Breeders’ Association) stud book. The vast majority of breeders work with mixed-breed Iberian pigs, generally a mix of purebred with a European breed. They are selected due to their high yield, however the flavours and aromas are different from 100% Iberian pigs. Cinco Jotas only chooses purebred Iberian pigs and they rely on an extended team of veterinarians and experts who are dedicated exclusively to the study, care and control of 100% Iberian pigs. In the curing cellars Cinco Jotas ham is cured slowly and naturally, a process which can take up to five years to complete. The black pigs have an athletic body and walk an average of 14km a day!! They are constantly moving and eating. This means they receive a high oxygen intake and this is one of the reasons why jamon is such a deep red colour. The acorns are the most important fruit that the pigs eat. The properties of the fruit are beneficial for the pigs as they are comprised of carbohydrates and oleic acids contributing to healthy ham. The acorns help create a special flavour and texture. Other pigs are fed a mix of commercial feed and acorns whereas Cinco Jotas pigs feed on what they can find in the property (wild mushrooms, berries, fruits, grass, herbs) and acorns during season. The black label, a guarantee of excellence and quality, also validates the product as acorn-fed 100% Iberian. Only products with the black label can be called pata negra, or “black hoof”. The town and environment in which the black pigs are cured is particularly unique. Jabugo is located in a Biosphere Reserve as recognised by UNESCO and this unique environment contributes to the particular and special environment in which the jamon is cured. In the curing cellars Cinco Jotas ham is cured slowly and naturally, a process which can take up to five years to complete…that is quite a while! Hence the reflective price tag on each leg of jamon. There is a master in salting the jamon, drying the jamon, a master of the curing cellars and master carvers. Every little detail in the entire life and curing span of the pig/jamon is important and has been perfected. Details such as temperature and humidity in the cellars can impact the process and these need to be adjusted at times. That is why Cinco jotas looks at every detail so importantly and respectfully to create a consistent high quality result. I hope that one day you can visit this incredible place! Make sure you savour every slice of jamon. 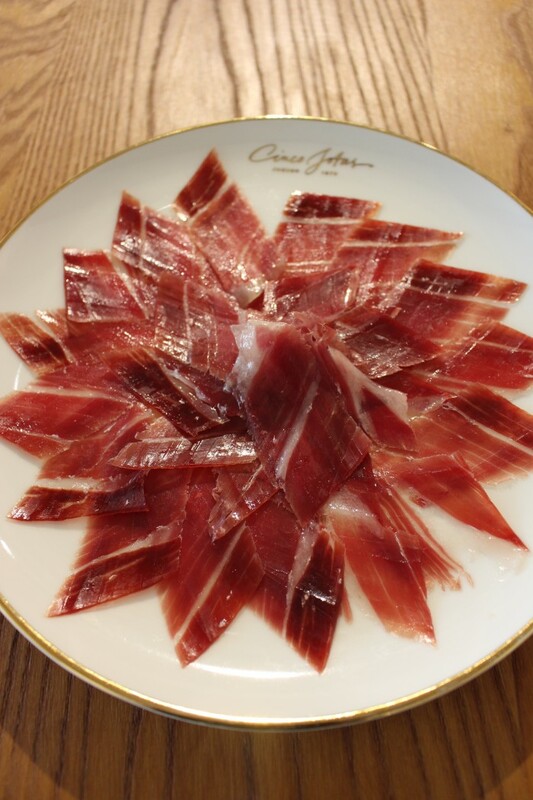 If you can’t make it to their cellar you can find Cinco Jotas jamon in most good Spanish bars and restaurants, as well as retail stores and jamon stores around Spain. A guide to visiting their cellar in Jabugo. ohhh it is quite remote isn’t it! And you wouldn’t expect it to have this spectacular bodega and jamon tasting going on there! I love that about Spain…the smallest towns can have something incredible hidden within them. Pretty sure one of the plazas in Jabugo is named ‘Plaza de Jamon’.